Campeggio La Vallée Heureuse si trova a Orgon, Bocche del Rodano, è situato a un lago. Il campeggio a terrazze dispone di piazzole delimitate, sia ombreggiate che e piazzole poco ombreggiate. È possibile affittare tende, casemobili e Monolocali. Ogni anno un ispettore visita il Campeggio La Vallée Heureuse, controllando oltre 200 tra attrezzature e altri punti di interesse del campeggio. L'ispettore è un dipendente ACSI e non lavora per il campeggio. We stayed in this site for a week in June. First of all the young Dutch couple managing the site are very helpful, polite and of course speak fluent English. The facilities are up to date and very clean. The camp site has three levels, the lower one being the most popular as it's near the facilities and offers most shade. The higher levels are more private but not as close to the lavs etc. The site is set in a gorge with high sides and as such can be very hot. There is no restaurant but drinks are available but the local town offers little although there's an Inter Marche close by. Very popular with the Dutch. Recommend. I was impressed with this camping, although (as with many other sites) the staff do tend to "herd" campers together by closing areas of the site in low season. Because of this, we found that we were only given the choice of a very limited number of pitches that put us next to others (we like quiet secluded pitches). Most of the team were super-friendly & helpful (the site cleaner & all the male staff notably), and the site also offers free bike loan & free ice cube machine (very welcoming & useful). As stated in other reviews, the steep sided valley does cut out the sun from quite early in the afternoon on many pitches. The pool is lovely & the general ambience fantastic. The lake was a bit of a disappointment (not that I'am sure quite what we expected). The high tech taps (light activated) were a bit of a pain (constant waving of hands), although the facilities were otherwise spotless & modern. There is a fab restaurant (La Cote Jardin) in the town within a short walk (divine menu). Used as an overnight stop to South of France. Excellent English. Fairly small pitches. lovely surroundings in a gorge. A truly beautiful setting, incredibly helpful staff, easy and quick from the motorway, excellent for exploring the Alpilles, Luberon and Avignon. Top class. Volete prenotare il campeggio Campeggio La Vallée Heureuse o oppure saperne di più? Potete farlo usando i seguenti dati oppure tramite il sito del campeggio. A7 fino a Cavaillon uscita 25. Direzione St. Rémy-de-Provence. Direzione Sénas fino a Orgon. Il camping è segnalato. 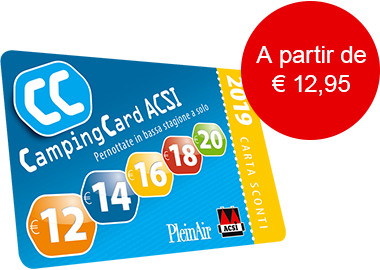 ACSI Eurocampings invia la tua richiesta di informazioni al "Campeggio La Vallée Heureuse".